4 Zi, 1 Bad, Schlafmöglichkeiten für 8 max. Dieses charmante Chalet wir 'Loon Landing' sitzt gegenüber von einem öffentlichen Strand auf einem Teich im Dorf Eidelweiss, einen Urlaub Gemeinde in Madison, NH am Eingang zum Mt. benannt haben Washington Valley. Sie können auf dem Deck sitzen und die Menschen am Strand nennen! Das Obergeschoss verfügt über ein Wohnzimmer mit einem Holzofen, große Essecke, Küche, Bad und Schlafzimmer, die ein Queen-Size-Bett hat. Im Erdgeschoss befinden sich drei Schlafzimmer mit Queensize-Betten und ein Spielbereich. Die offene Pfosten- und Balkenarchitektur im Inneren kombiniert mit einer hervorragenden Bergsee-Lage im Freien machen dies zu einem reizvollen Urlaubsort! Sehr schöne Kinderspielplatz ein paar Meter entfernt. Wonderful stay, it's a wonderful thing to wake up that close to the water. Would definitely be coming back. Owner tried to communicate with us and see our needs were meet. Even stopped by as we were leaving to get our feedback. It is a great place to relax and recover from daily stress! Better than typical cabins. It, as all cabins, are not going to be as nice and comfortable as your home. This is close to our old lake house I remember as a kid. My husband, our dog and I loved it! We hiked and canoed. The only downside is that dogs are not allowed to swim in the lake, but it was too cold for that anyway. Would go back anytime! This chalet is warm and cozy very inviting.Kevin is the nicest guy to deal with will go out of his way for you! The view and location are beautiful. I highly recommend this hidden gem!! Thank you Kevin for sharing your nice home!! Thank you Tim for being a perfect guest! It is obvious you read all the instructions and followed to a T. The chalet was left very clean and ready for the next guests. I appreciate your business and we hope you come again! We loved this little cabin! The main (second) floor has a great open layout and a beautiful view out onto the pond, and the bedrooms are all very comfortable. We had a cold winter weekend there and loved getting cozy using the wood stove. The location is very convenient, and Kevin, the owner, was very responsive and accommodating. We loved our stay! Thank you Reagan for choosing Loon's Landing for your visit here. I'm very pleased that you found everything accommodating. Thank you for following all the rules and for leaving everything as it should be. Please come again! This chalet was perfect for our family of 5. The house was well laid out with plenty of space. The kitchen table was enormous. The wood stove heated the place up real quick. The owner Kevin was easy to work with, he provided a detailed guide to the house and surrounding area. This house was an easy 20 minute drive to North Conway and 15 minute drive to King Pine Ski area. The 2 decks look like they would be very nice in the summer. We would definitely rent this house again. Es ist nur 4 Meilen zu Conway, und 7 Meilen zu North Conway. In Eidelweiss finden Sie: Schwimmen (über die Straße), Wandern, Kanufahren, Schneeschuhwandern, Schneemobil fahren, Angeln, und einen Spielplatz. Genießen Sie einen schönen Naturlehrpfad mit einem Strom (nur auf der Straße) oder entspannen Sie sich auf dem Deck Hören der Seetaucher, während Sie die Kinder am Strand zu sehen! Der Teich zieht viele Wildtiere wie Seetaucher, Biber, Füchse, Schildkröten, Kojoten, Elche und Hirsche. In der Nähe werden Sie Skifahren, Wanderwege, Outlet Shopping, Golfen, Schläuche, Restaurants, Freizeitparks (Storyland), Mt. finden Washington, Minigolf, Antiquitätenläden, Fryeburg Fair (September / Oktober), und vieles mehr! Ob Sie entspannen mögen oder beschäftigt zu bleiben in Ihrem Urlaub, werden Sie viel von beiden am Loon Landing zu finden! Guests are required to sign a rental agreement. 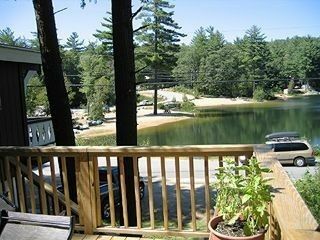 A 9% NH Room Tax is charged plus a refundable security/cleaning deposit of $100.00.